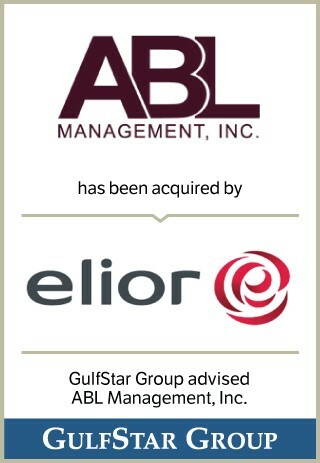 HOUSTON, November 30, 2015 - GulfStar Group ("GulfStar") is pleased to announce the acquisition of ABL Management, Inc. (“ABL”) by Elior North America (“Elior”). GulfStar served as the exclusive financial advisor to ABL throughout the transaction, which closed on November 20, 2015. ABL is a Baton Rouge, LA based provider of dining services to the Correctional market, and its subsidiary, ABL Educational Enterprise, provides foodservice to the Higher Education markets. ABL will continue to operate under its name, and will be led by John Appleton, its current president and founder, who will report directly to Brian Poplin, Elior president and CEO. Elior North America enhances the lives of the people it serves through culinary innovation and a commitment to providing exemplary service. The family of companies, with over 13,000 employees, provides culinary management and catering services to more than 1,100 client accounts in five industry segments across the continental United States. Elior is a chef-centric, food-focused organization consisting of strong regional brands (ABL, Aladdin, A’viands, Cura, Preferred Meals, Starr Catering Group and Valley Services) that provide superior local service delivery, innovative culinary programs and efficient operations. “We congratulate John Appleton, Sandee Scott and the talented team at ABL Management on the completion of this very successful transaction. Over the last 25 years, ABL has built one of the largest and most efficiently managed contract foodservice businesses in the Country. The integration of ABL into Elior is a perfect fit, as it geographically enhances the acquirer’s strong market footprint in the Western and Southeast U.S. markets, and delivers a large number of critical home office and in-market managerial resources,” said Scott Winship, managing director of GulfStar. The GulfStar team consisted of Managing Director Scott Winship, Associate Ben Stanton and Analyst Aaron Pyle. GulfStar is a leading middle market investment bank headquartered in Houston. GulfStar specializes in providing merger and acquisition advisory services, institutional private placements of equity and debt, and general corporate finance advisory services to companies with revenues or enterprise values generally ranging from $25 million to $350 million. Since its formation in 1990, GulfStar has completed more than 650 transactions in 32 states and 15 foreign countries across a variety of industries. For more information, please contact Scott Winship at swinship@gulfstargroup.com. Securities offered through GulfStar Group I, Ltd. an affiliated entity, member FINRA - SIPC.